If you've changed the region of your Google Play Store in order to download a game or app unavailable in your home country, you'll appreciate Google's latest addition to the Play Store. The new Country and profiles feature quickly allows visitors to what used to be called the Android Market, to check out what apps are available in different countries. First, keep in mind that Google is offering this feature only to Android users who meet a certain criteria. Open the Google Play Store app on your device and click on Account. If you have met the criteria, you will see on the Account page a new option called Country and profiles. If you have it on your Play Store app, click on it. You will now see which country your Google Play Store app is set to, along with a list of countries that you can choose from. Select the one you want and you are taken to that country's version of the Google Play Store. 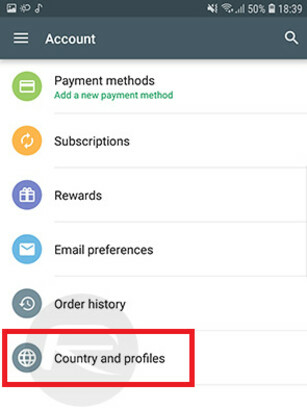 If you are not the adventurous type and have never strayed from home when making a purchase from the Google Play Store, you most likely will not see the Country and profiles option on your phone. Gime gime gime! Why are some apps region locked is beyond my comprehension. It was a "figure of speech", I know many shops and app stores restrict content in countries. But reasons why are often (always) really dumb like not appropriate, different market or licence issues. It's 2018, this should have not existed for years now. Not available in US or is it just me? Second paragraph: "Those given the opportunity to use the new Country and profiles feature are those who have previously made a valid purchase using a valid payment method from a version of the Google Play Store belonging to a different country than the one the user lives in" Have you lived or made a purchase on the Play Store while you were in a different country? Guys I need some help, Whenever I want to purchase something a pop up message show that "your transaction cannot be completed" I've done everything verified my account , checking address but problem not solve yet, what should I do ? Contact google through an email.